Sun Ra & his Arkestra, Sun Ra and his Myth Science Arkestra, Sun Ra, Sun Ra and his Solar Arkestra, Sun Ra and his Arkestra and more. Today Earth celebrates 100 years with the spirit known as Sun Ra. he came to our planet and created the Arkestra to spread love and knowledge through his cosmic tones. They played the music of the cosmos, jazz from other planets, melodies that echo throughout the universe, tonal clusters designed to shake you out of your foundation and have you grasping at the stars. 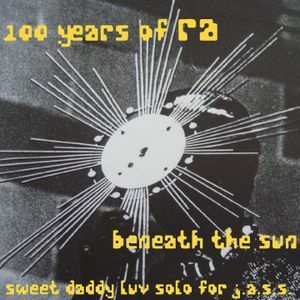 This mix is one of two created by sweet daddy luv to celebrate the centennial of this great man. This mix, &apos;Beneath The Sun&apos;, tells of Sun Ra&apos;s introduction and exploration of planet Earth; culminating in the awakening of humankind and our opening of the doors to the cosmos.